Clean, Polish & Protect Most Types of Metals. Keeping britework clean and free from rust spots is essential for the overall appearance of your vehicle. 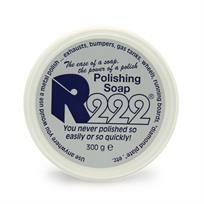 R222 Metal Polishing Soap is capable of removing even tough tarnishing, deeply embedded corrosion and contamination, but gentle enough to use regularly. Easy to use, requires very little 'elbow grease'!